PELCO® lapping products available for sale worldwide. 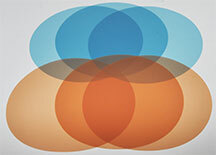 Imperial Diamond Lapping Film offers a repeatable, precision finish on extremely hard materials. It combines micron-graded diamond particles, a resin bonding system and a highly uniform 3mil (0.08mm) polyester film backing for a cleaner, more consistent alternative to diamond compounds or slurries. Better than paper backing under wet conditions. Available with Plain back or PSA (pressure sensitive adhesive) in 8 " discs. NH = no hole. Type 661 Imperial Diamond Lapping Film replaces type 651. Type 661 has a more robust, 3 mil (0.08mm) polyester backing film, while the type 651 had a 2 mil (0.05mm) backing film. PSA back version shown with pull tab to expose adhesive. Diamond particles are encapsulated within ceramic beads then coated onto 3 mil polyester film. Provides a more aggressive cut, coarser finish, and longer life than standard Diamond Lapping Film. Also offers a clean and more consistent alternative to diamond compounds or slurries. Use to finish and polish hard to grind materials such as glass, ceramics, hardened metals, and composites. Best to use with water for cooling and lubrication. Available in Plain and PSA (pressure sensitive adhesive) back. The standard of 3M premium diamond abrasive films. 668X PSA has a 3 mil polyester film backing with PSA (pressure sensitive adhesive) back. Use with water. The standard of 3M premium diamond abrasive with a 3 mil polyester backing, offering a cleaner, more consistent alternative to diamond compounds or slurries. Use to finish and polish hard to grind materials such as glass, ceramics, hardened metals, and composites. Can be used wet or dry. Premium, precision lapping 8" discs for producing a super-fine, super-consistent finish. 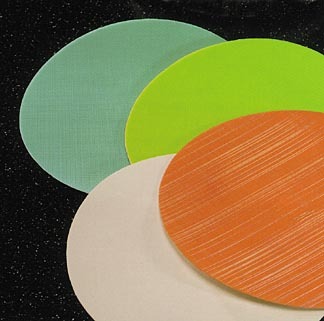 A high strength smooth polyester film backing provides a uniform base for a coating of micrograded aluminum oxide or silicon carbide particles that are uniformly dispersed for greater finishing efficiency. A carefully controlled resin bond ensures a consistent, reliable and repeatable finish. Clean room coating and converting ensures contaminant-free products. 3mil (0.08mm) polyester film backing. Available with plain back or PSA (pressure sensitive adhesive) in 8" discs. The aluminum oxide discs can be used for polishing steps. Use wet or dry. Applications: metals, plastics, metallography, thin film discs, floppy discs, fiber optic connectors. Ideal for damp finishing solid surfaces, glass defect repair and acrylic solid surface finishing. 3M Trizact consists of aluminum oxide particles having tiny precisely shaped pyramids reproduced on a polyester film backing. Also useful for: metals, plastics, composites, ceramography, metallography. The pyramids wear away evenly and continually expose new abrasives. Fewer processing steps can be taken, a higher gloss level achieved and effective surface leveling takes place. Little wear is required and there is easy “touchup”. Waterproof backing. Available in 8" discs with PSA (pressure sensitive adhesive) back. Powerful replacement for mineral spirits, solvents and other unfriendly cleaners. 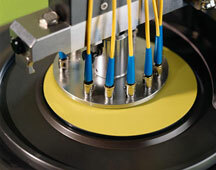 Ideally suited for removing used grinding/lapping/polishing discs with PSA backing from their support discs. New food-grade citrus based 3M adhesive remover is also very effective in removing overspray of any aerosol adhesives, grease, oil, grime, tape residue, tar, wax, etc. A solvent-free formulation that provides wipe-away convenience with no filmy residue.